Headline: "The factions welcome [the operation], candies in the streets"
The Islamic Jihad Movement called to 'the members of our proud people in Jerusalem, the West Bank, and everywhere to carry out intifada against the settlement terror, until its removal and the liberation of the West Bank from the settlements and the settlers.' It emphasized that '[the spilling of] the heroic Martyrs' blood, the targeting of children, and the harming of the Al-Aqsa Mosque will not pass in silence.'" Posted text: "The Israeli government - which tries to protect those who steal the Palestinian land and to deny the rights of the Palestinian people, which have been established by international decisions and law - is incapable of protecting anyone that steals the Palestinian land, regardless of what [military] equipment it owns, how much power it has, and how much it uses terror and murder. Today's [Oct. 7, 2018] operation is additional proof of this. The only solution lies in recognizing the rights of our people, by realizing the Palestinian national independence in the framework of a free and fully sovereign state, which will be established on the occupied land and on the June 4, 1967, borders, and whose capital is East Jerusalem. 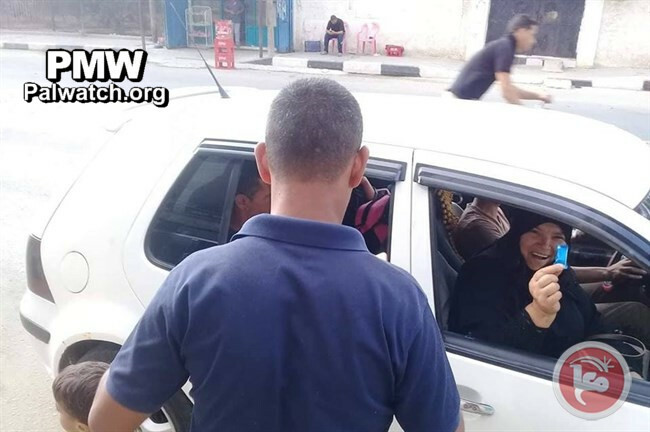 Any attempt to bypass these rights will not benefit Israel and will not bring security to it and its citizens as nobody will achieve security as long as our people remains denied its rights in its homeland. 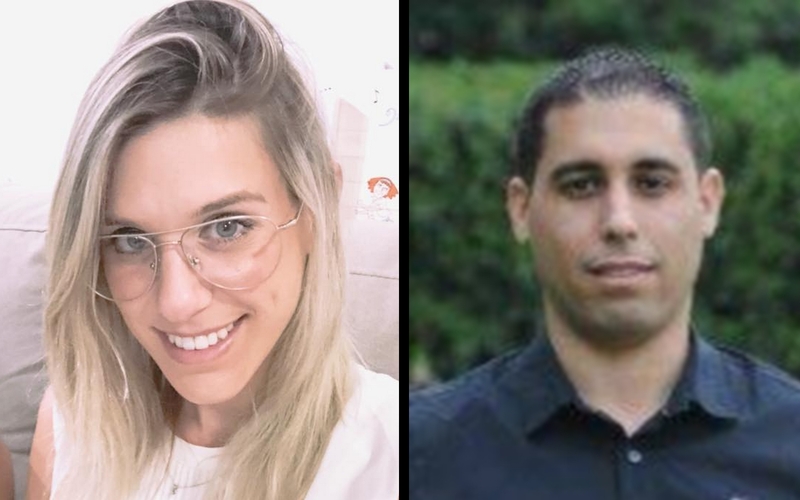 Head of the Information Office of the Fatah Movement's Mobilization and Organization Commission"
Barkan Industrial Zone Attack - 23-year-old Palestinian terrorist Ashraf Walid Suleiman Na’alwa shot and murdered 2 Israelis, Kim Levengrond-Yehezkel and Ziv Hajbi, in a factory in the Barkan Industrial Zone near Ariel on Oct. 7, 2018. Na'alwa fled the scene and has not yet been apprehended as of Oct. 8, 2018. Until this attack, the Barkan Industrial Zone had been an example of coexistence with Israelis and Palestinians working together. Khan Al-Ahmar is a site where Palestinian Bedouins have illegally erected dwellings and a school, mostly simple shacks, on land in Area C (i.e., land under full Israeli administration according to the Oslo Accords). The Israeli authorities have ordered the demolition of these structures and offered alternative sites for them. A number of petitions to the Israeli Supreme Court against the demolition orders have been considered and then rejected by the court. As of Oct. 8, 2018, the illegally constructed buildings have not been demolished. Palestinians have held protests at the site against the demolition, some of which have turned violent. 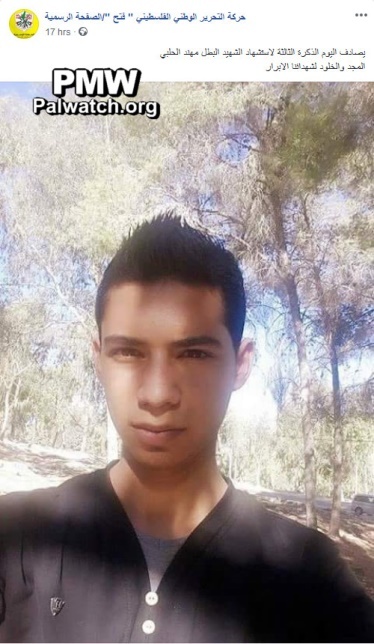 Muhannad Halabi - 19-year-old Palestinian terrorist who murdered 2 Israelis, Rabbi Nehemiah Lavi and Aharon Bennett, and injured Bennett’s wife, Adele, and their 2-year-old son in a stabbing attack in the Old City of Jerusalem on Oct. 3, 2015. Following the attack, he was shot and killed by Israeli security forces. 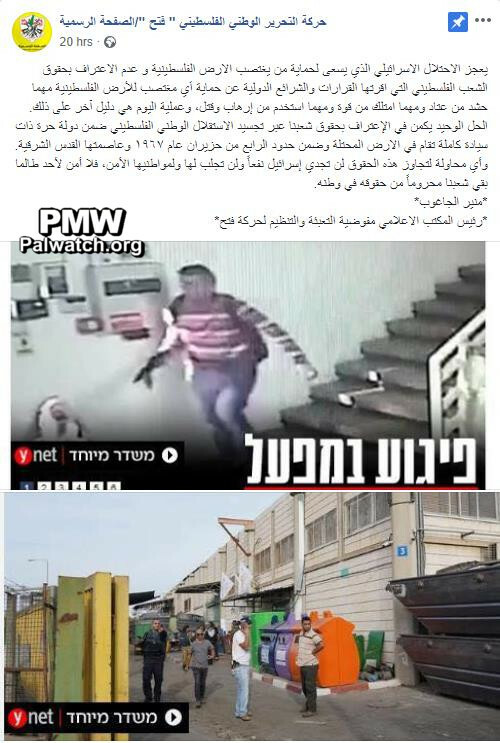 Prior to his attack, in a post to his Facebook page, the terrorist referred to recent terror attacks as part of a "third Intifada,” and said that it was a response to Israel’s actions at the Al-Aqsa Mosque and that the Palestinian people would not “succumb to humiliation.” This is a reference to the PA libel that Israel is plotting to take over and destroy the Al-Aqsa Mosque and to the PA's portrayal of Jews praying on the Temple Mount as "an invasion of the Al-Aqsa Mosque."